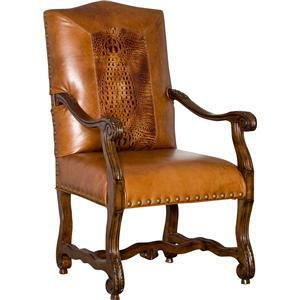 This traditional style upholstered chair is a unique addition to your home with beautiful exposed wood details. A classic finish is used on the wood legs, stretchers and arms and feature carved leaf like details. 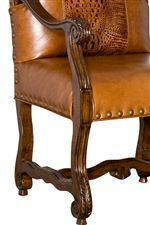 Nailhead trim is used along the back and across the front to complete the look of the chair. With a variety of fabric options and the choice to pick a complimentary seat back fabric this chair is easy to customize to create a piece that is a reflection of your personality and perfect for the traditional style in your home. The 106 Traditional Upholstered Chair with Exposed Wood by Mayo is available in the area from BigFurnitureWebsite. Arm Exposed wood arms with carved details. Leg or Skirt Exposed wood legs and base with carved details in classic finish. Seat Support Most Mayo products feature 8 gauge sinuous wire seat springs that are connected from side to side with spring steel wire for stability and lateral support. Some models feature a drop-in coil spring seat system. Padding & Ergonomics Only the highest quality seat cushion is used on Mayo products for a stylish appearance and long lasting comfort. Seat cushions use a 2.0 pound high density polyurethane foam that is fabricated inside factory to maintain the highest quality assurance standards. Some models feature plush foam with a softer 1.8 density seat foam.